This article is about a huge amount of work and dedication to a nice etsy shop with amazing polymer clay flower jewelry. I hope you enjoy the creations I selected for you. 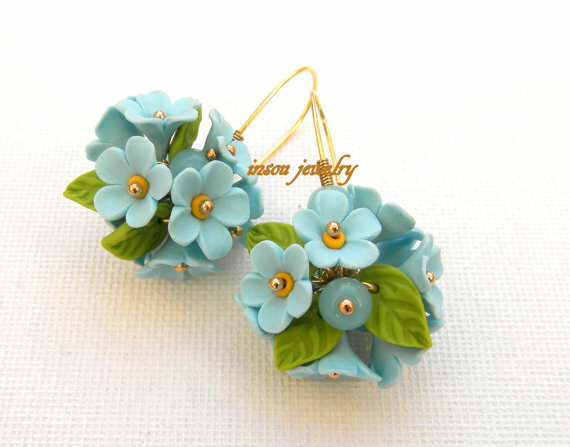 Don’t hesitate to follow the link, there are much more polymer clay flower jewelry there than you can imagine! 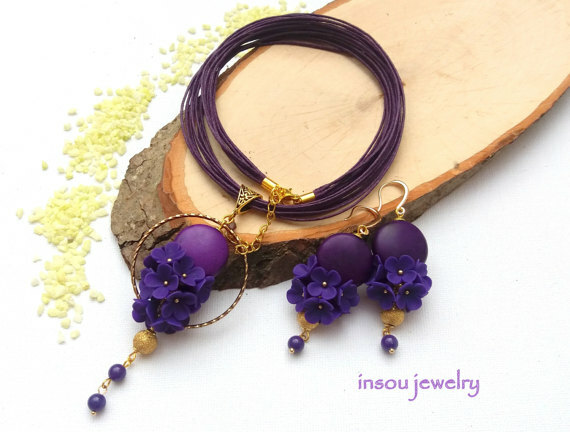 Insou jewelry is a team of mother and daughter, Iness – self-taught polymer clay artist and Susan, who is responsible for running the shop on etsy. They get inspiration from rich and diverse nature. 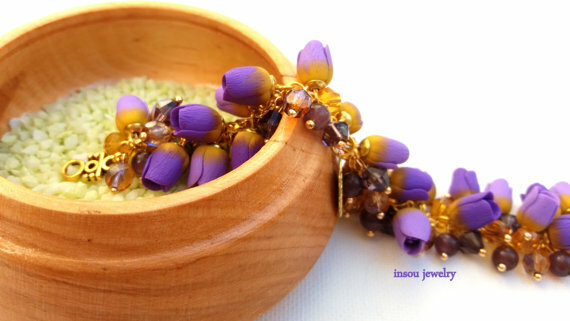 This spring necklace features a bouquet of delicate violet anemones, light yellow crocus and forget me not flowers, decorated with Czech glass beads. Flowers and leaves are attached on a gold plated wire, covered with a gold coloured ribbon. It ends with glass tube beads and a lobster clasp. 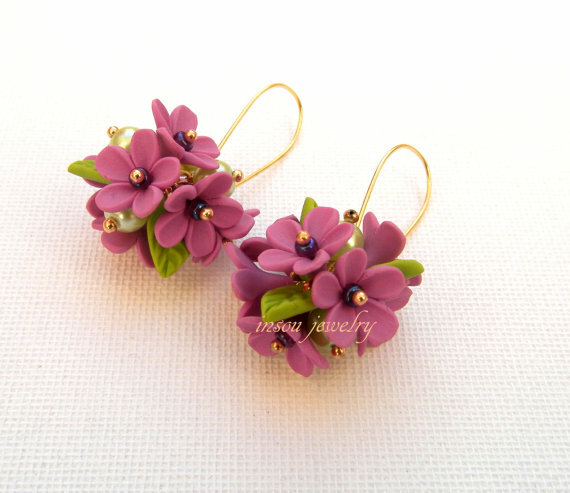 These earrings feature bouquets of hand sculpted violet lilacs, decorated with light green leaves. They are completed with glass pearls and hang on gold plated hooks. 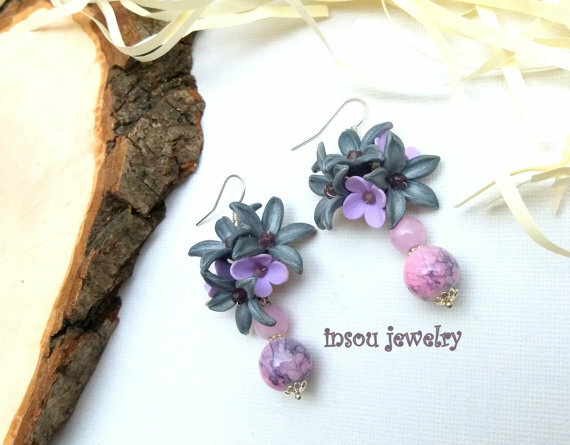 These earrings feature mini bouquets of hand sculpted light blue buttercups and violet forget me not flowers, decorated with a violet lampwork bead and jade beads. Each bouquet is attached on a gold coloured bead cup. They hang on gold plated hooks. 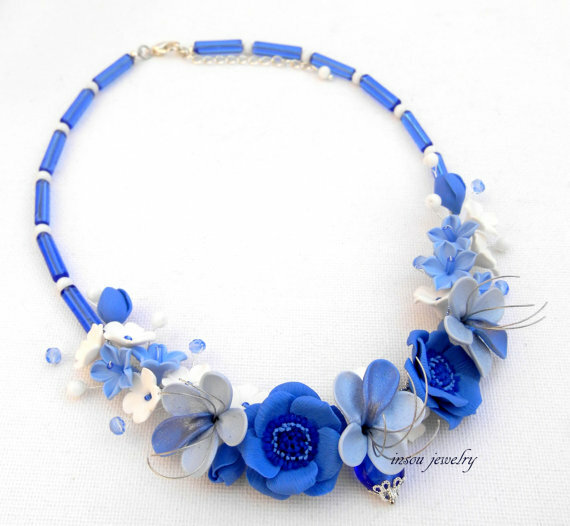 This polymer clay flower jewelry set is so beautiful!. A flower statement necklace that features hand sculpted peony flowers of violet and rose pearl colors. The necklace is decorated with violet Czech glass beads and glass pearls of dusky pink colors. It is completed with bronze chains of different size. It ends with a bronze toggled clasp. 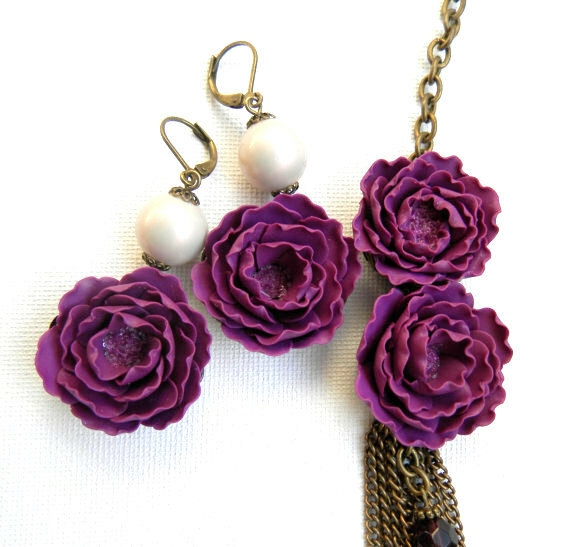 The earrings feature handmade violet peonies and glass pearls. 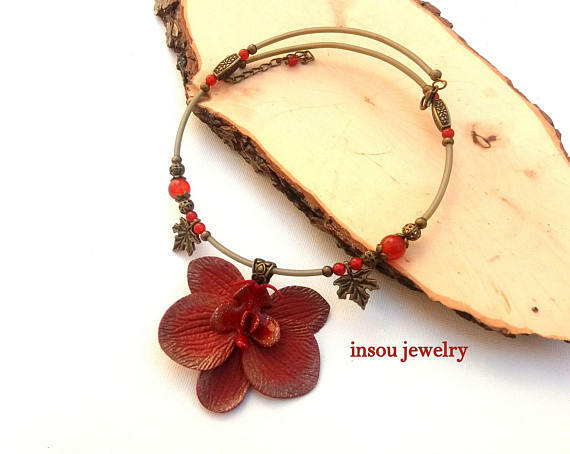 This bracelet features dark red and dark green waxed cotton cords, decorated with alabaster and marble beads, antique bronze leaves and antique bronze charm. 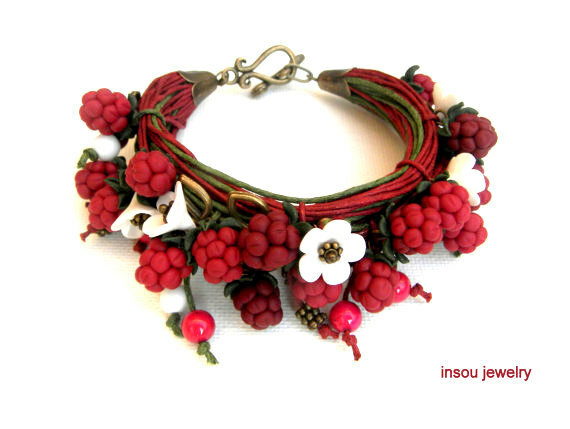 The bracelet is decorated with hand sculpted raspberies and raspberry flowers. 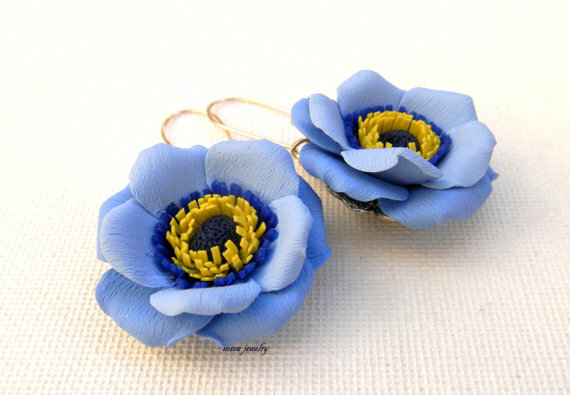 These earrings feature captivating light blue anemone flowers. Each flower is hand sculpted with polymer clay and attached on a bead cup. They hang on silver plated hooks. 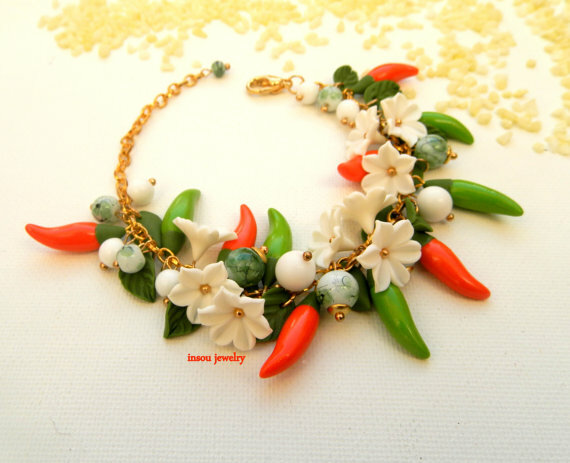 This bracelet features orange and green peppers decorated with white pepper flowers and green leaves. The bracelet is completed with painted emerald glass beads and white alabaster beads. These earrings feature bouquets of hand sculpted flowers: small lilacs and metallic grey buttercups. They are decorated with Czech glass beads and light lilac jade beads. 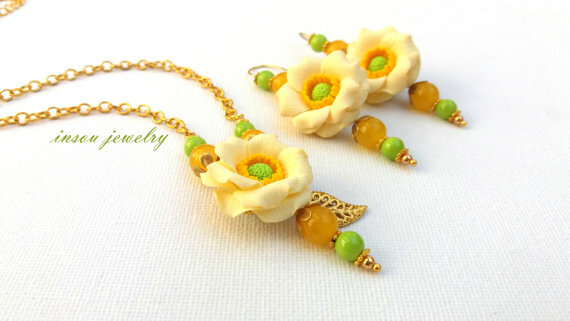 This polymer clay flower jewelry set is my favorite! 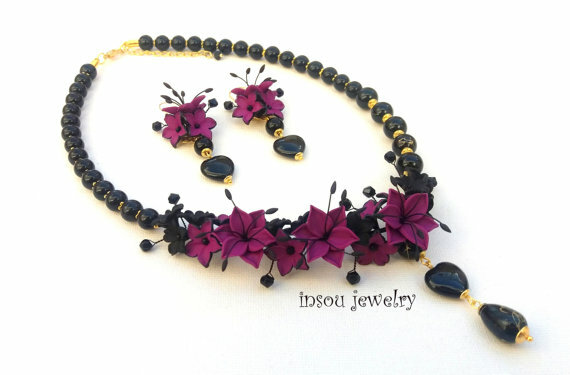 The statement necklace features a bouquet of hand sculpted violet lilies, violet/black buttercups and black lilacs. The necklace is decorated with black Czech beads and acrylic black/gold beads. Everything is attached on a black wire. It ends with a gold plated lobster clasp. 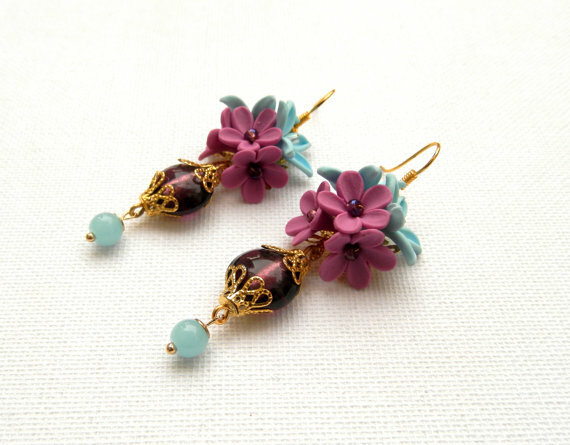 Earrings feature mini bouquets of violet lilies and buttercups, decorated with black beads. They hang on gold plated hooks. 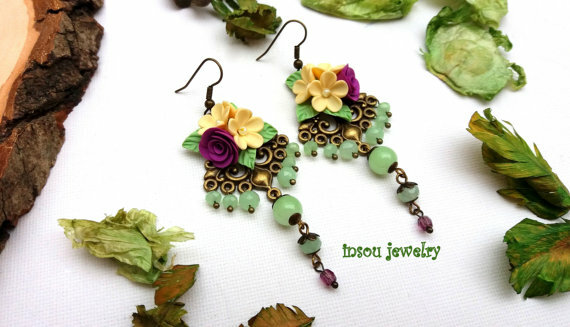 These romantic earrings feature a beautiful bouquet of hand sculpted bordeaux lilacs and bordeaux-green Czech glass beads. They are attached on gold plated hooks. 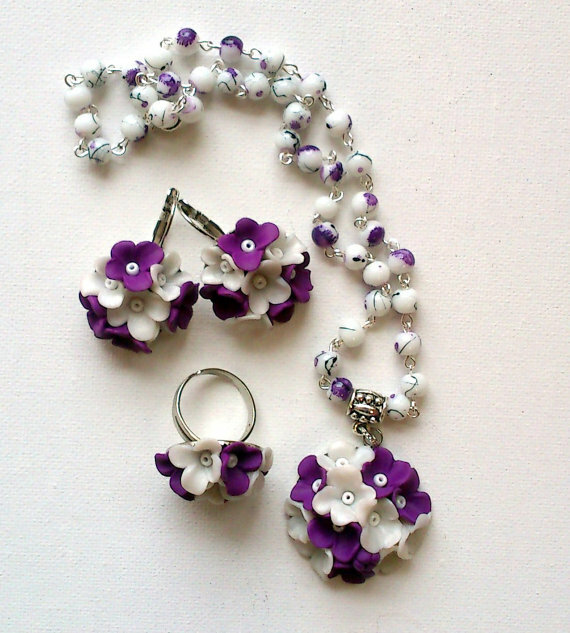 Look at this beautiful polymer clay flower jewelry set! 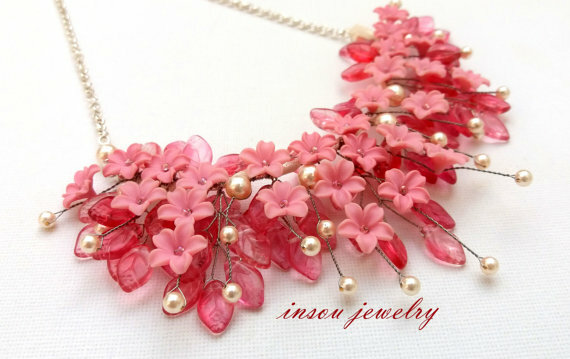 The necklace features a romantic bouquet of sakura and snowdrop flowers. Sakura flowers have a smooth transition from white to light pink colour. Snowdrop flowers are painted with green dry pastel and decorated with transparent glass seed beads. The bouquet is decorated with jade, alabaster and Czech glass beads. Everything is attached on a silver colour wire which is decorated with a silver ribbon. It ends with a lobster clasp. The earrings feature handmade sakura and snowdrop flowers. 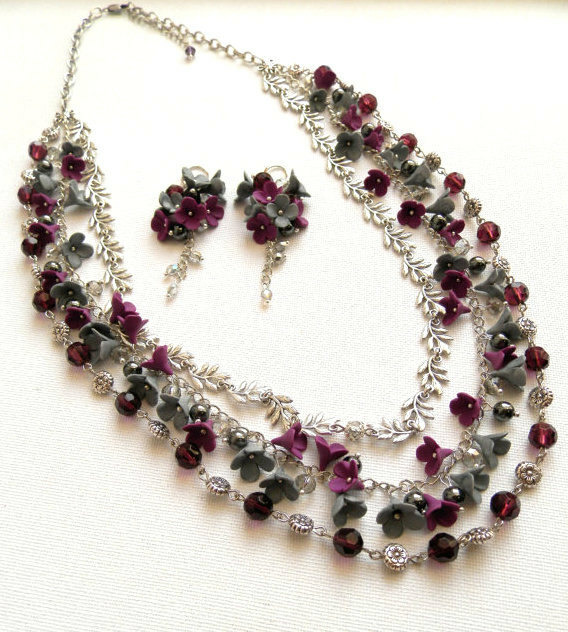 A beautiful romantic jewelry set! 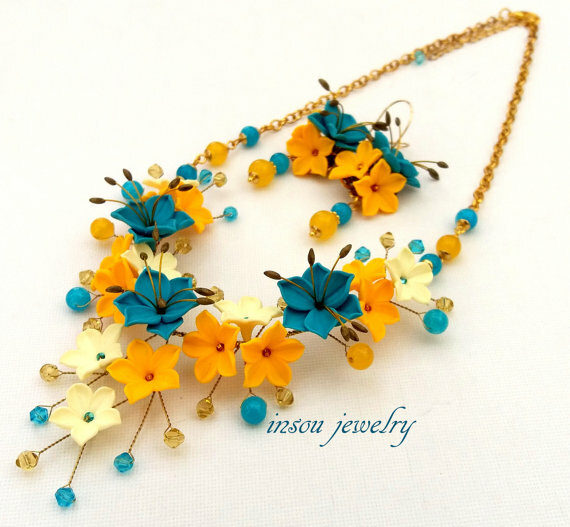 This unique necklace features a bouquet of flowers; lilies, buttercups, anemones, daisies in blue and orange colours, decorated with leaves. The flower bouquet is completed with Czech glass beads. The flowers are attached on a blue coloured wire, decorated with a silver coloured ribbon. It ends with a lobster clasp. 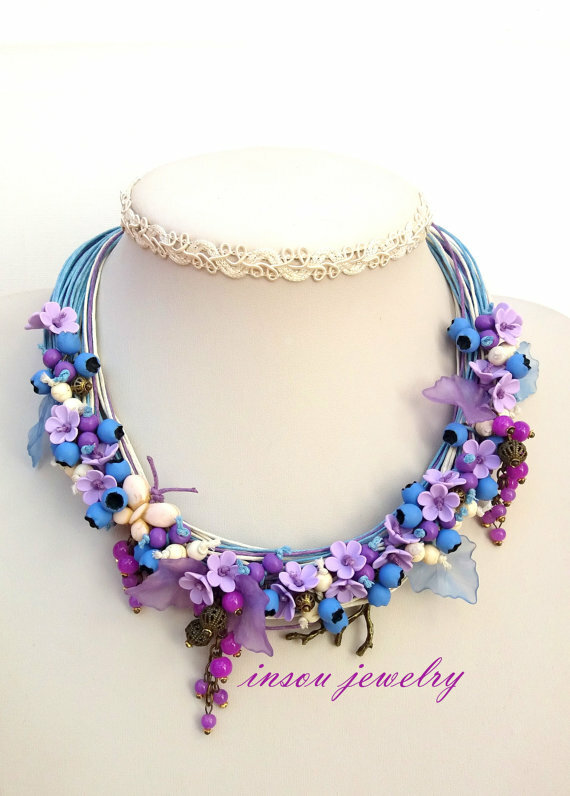 This spring necklace features a dazzling bouquet of lilacs, forget me nots and globeflowers, decorated with Czech glass beads. It is completed with a dragonfly charm. It ends with a lobster clasp. This romantic necklace features a hand sculpted bordeaux orchid flower, decorated with delightful agate and bronze beads. The flower is painted with gold dry pastel. It is attached on a rubber cord and finished with a bronze lobster clasp. 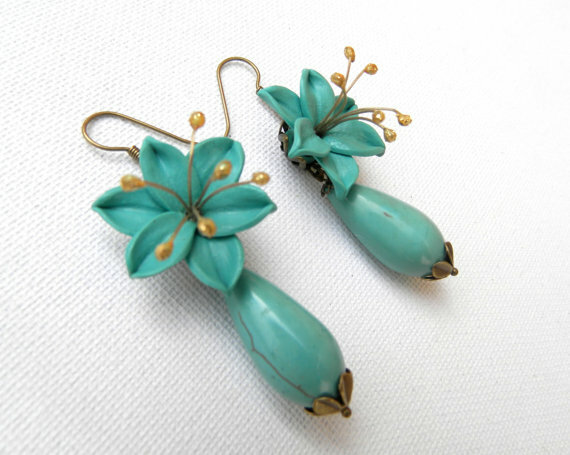 These earrings feature bouquets of hand sculpted light blue lilacs, decorated with light green leaves and jade beads. They hang on gold plated hooks. 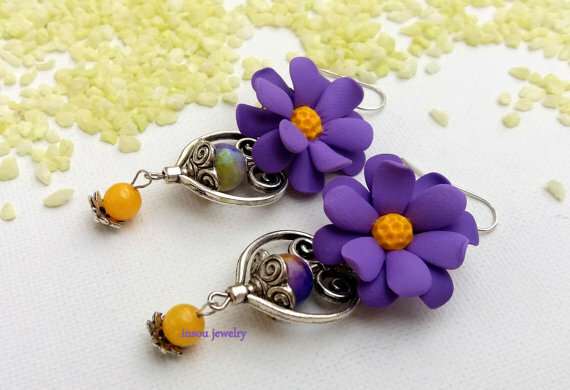 These earrings feature hand sculpted orange lilacs. they are decorated with blue Czech glass hearts. They hang on bronze hooks. These chandelier earrings feature delicate hand sculpted vanilla flowers and violet roses, decorated with light green Czech glass beads. They are completed with bronze findings and hooks. 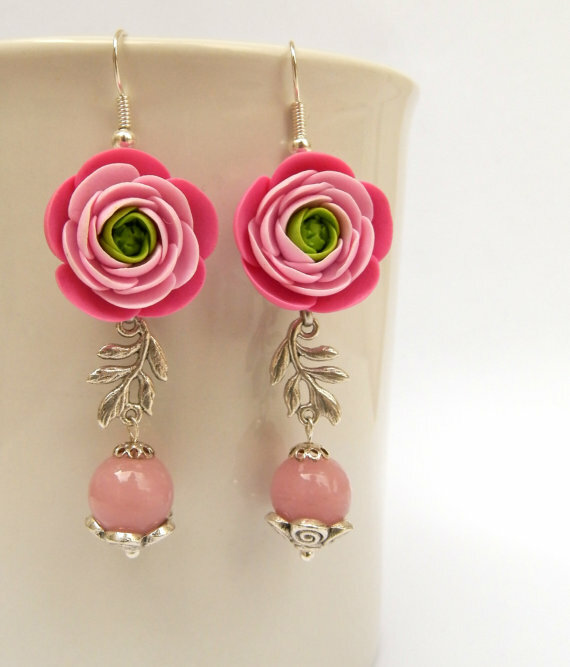 These romantic earrings feature pink roses with an ombre effect. Each flower was made completely by hand – in a gradated range of shades of fuchsia to light pink and green. Each rose is attached on a silver colored bead cup. They are decorated with antique silver leaves and light pink lampwork beads. They hang on silver plated hooks. 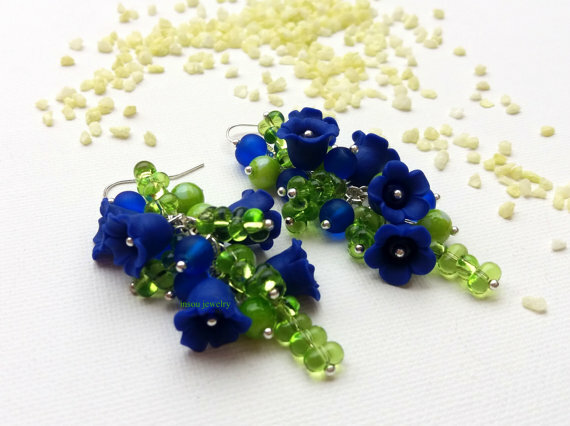 These romantic earrings feature a beautiful bouquet of hand sculpted blue bell flowers, decorated with Czech glass beads in light green and blue tones. They are attached on silver plated hooks. This romantic bracelet features a beautiful bouquet of hand sculpted orange/yellow delicate tulips, decorated with Czech glass and cat’s eyes glass beads in green and orange tones. Everything is attached on a gold plated chain. These statement earrings feature lilacs with an Ombré effect. Each flower was made completely by hand – in a gradated range of shades of blue. Flowers are decorated with Czech glass beads. They hang on gold plated hooks. 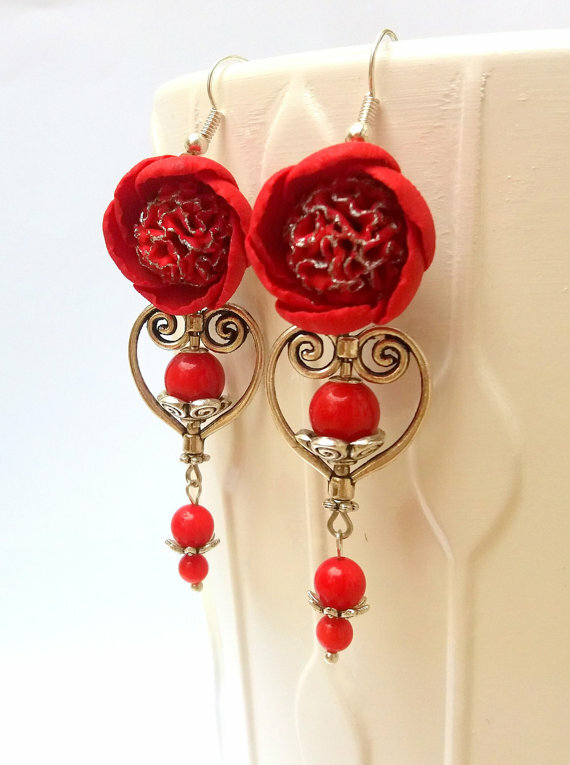 These earrings feature hand sculpted red peonies. They are attached on silver colored bead cups. The flowers are decorated with red coral beads and a silver color heart charm. They hang on silver plated hooks. 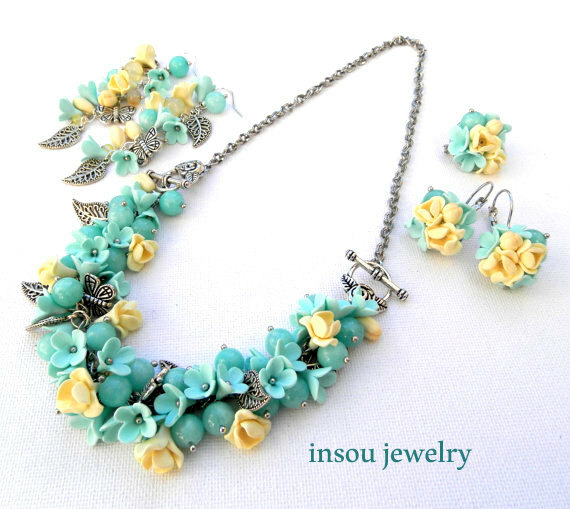 A mint polymer clay flower jewelry set of necklace/bracelet, 2 pairs of earrings & a brooch. 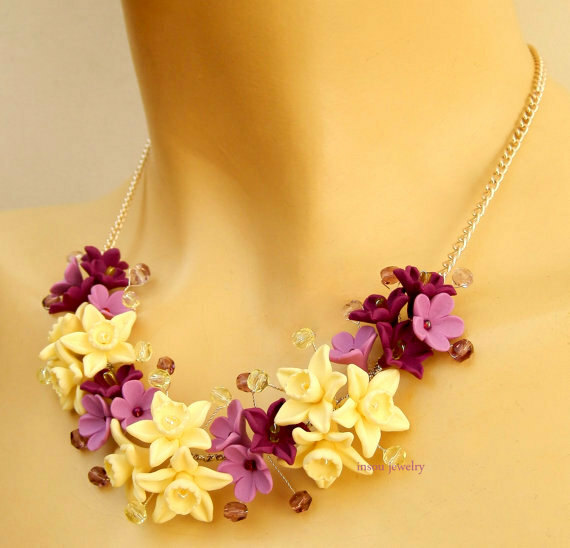 Necklace/bracelet: This necklace features mint lilacs and vanilla freesia flowers. Every flower is hand sculpted with polymer clay. The flower bouquet is decorated with mint/vanilla jade beads and antique silver leaves and butterflies. 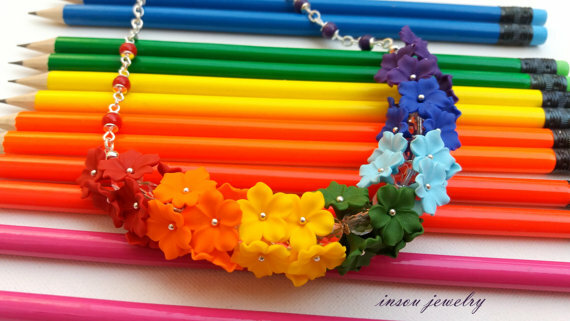 This beautiful necklace transforms into a bracelet!!! You just remove easily the silver metal chain and have a beautiful bracelet! 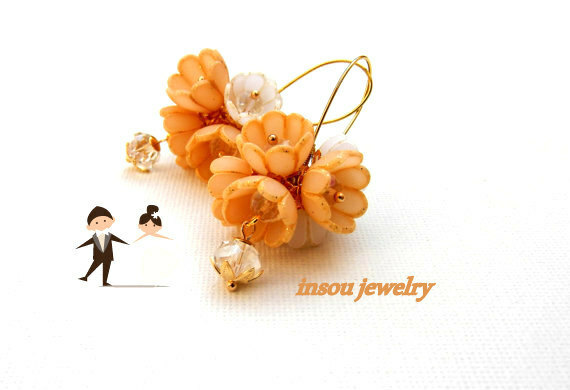 The first pair of earrings are long and feature a beautiful flower bouquet. The second pair of earrings feature delicate flower bouquets attached on silver copper clip studs. And a delicate, romantic brooch! 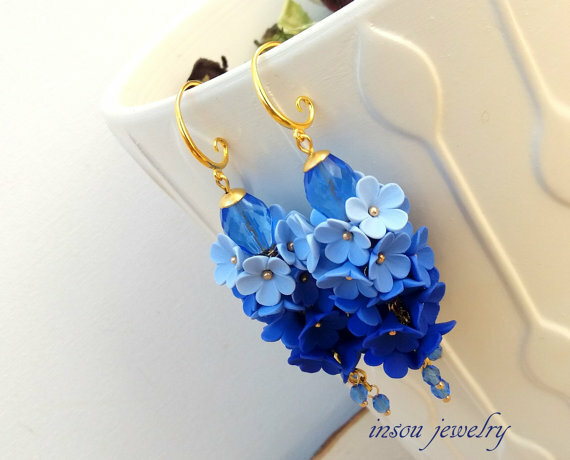 What a nice color combination has this polymer clay flower jewelry set. This multi stand necklace features hand sculpted grey and violet lilacs decorated with Czech glass beads and grey glass beads. It is completed with antique silver leaves, flower beads and connectors. The earrings feature grey violet lilacs bouquets attached on silver grey hooks. 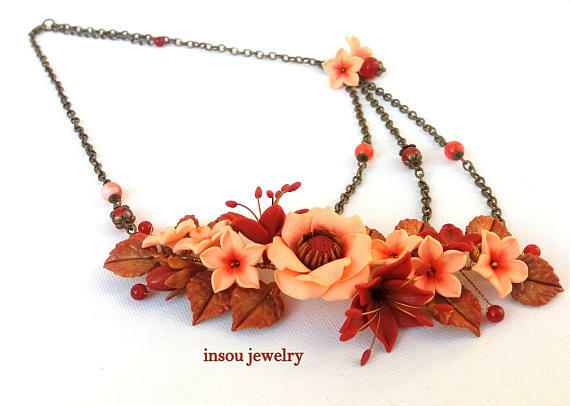 This unique necklace features a bouquet of autumn flowers, berries and leaves. The flower bouquet is decorated with Czech glass beads,antique bronze charm and wooden beads. The flowers are attached on a gold coloured wire, decorated with a gold coloured ribbon. It ends with a lobster clasp. This necklace features a bouquet of delicate bordeaux chrysanthemum flowers. Flowers are decorated with light green glass seed beads. Everything is attached on bordeaux and light green waxed cotton cords. It ends with a bronze chain and a dragonfly clasp. These earrings feature delicate white – pink sakura flowers and forget me nots. 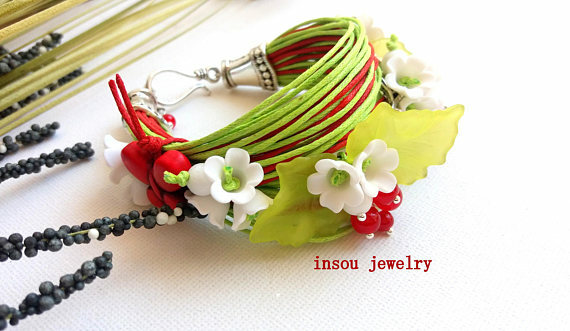 The flower bouquet is decorated with green leaves and alabaster beads. 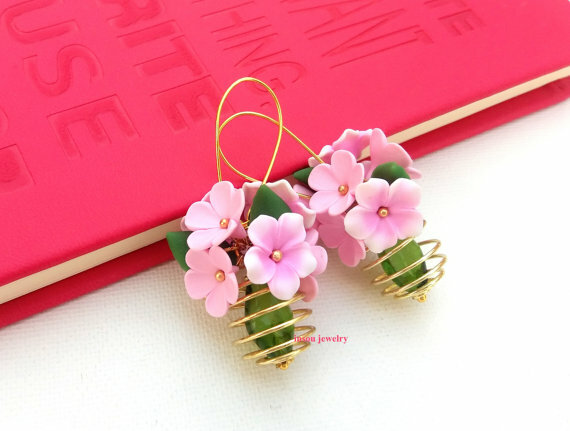 They are completed with green Czech glass leaves in a spiral gold plated bead cage. They hang on gold plated hooks. Forget me not bracelet. 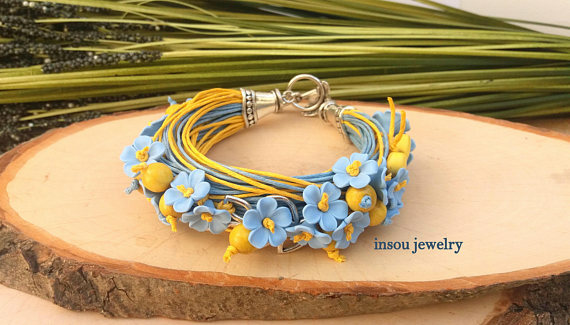 This bracelet is made of light blue and yellow waxed cotton cords, decorated with wooden beads, antique silver leaves and a butterfly charm. The bracelet is decorated with hand sculpted forget me not flowers. 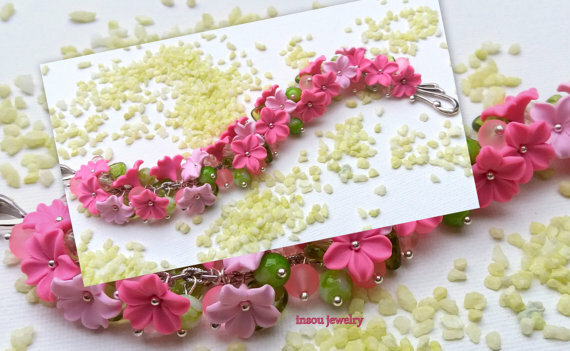 This bracelet features a beautiful bouquet of hand sculpted buttercups in shades of pink, decorated with Czech glass beads, frozen glass beads and green leaves. Everything is attached on a silver coloured chain. 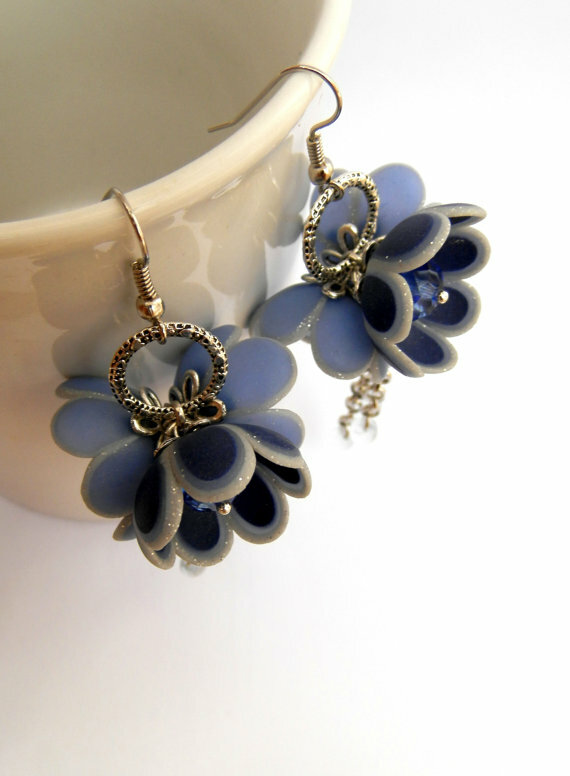 These earrings feature hand sculpted flowers in shades of blue. Each flower is made entirely by hand with polymer clay and petals are separated with silver glitter outline. They are decorated in the centre with Czech glass beads. Earrings are completed with transparent light blue tear drop Czech beads attached on silver grey chains. They hang on silver grey hooks. 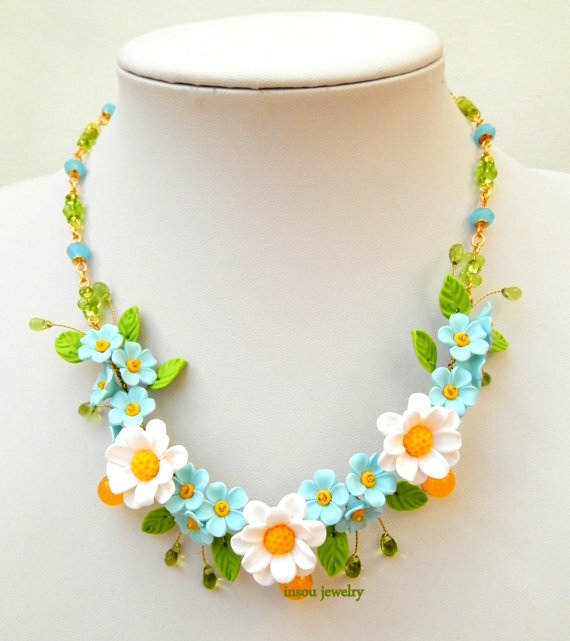 This necklace features a bouquet of hand sculpted white daisies, light blue forget-me-nots and light green leaves. 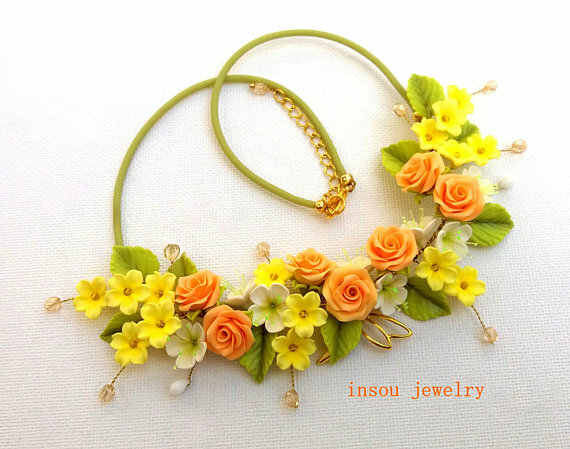 The flower bouquet is decorated with yellow jade, light green and light blue Czech glass beads. It is completed with a gold plated chain and a lobster clasp. This necklace features hand sculpted roses and light green leaves decorated with a mix of orange agate and yellow jade beads. Everything is attached on a bronze chain. The necklace is completed with a dragonfly clasp. 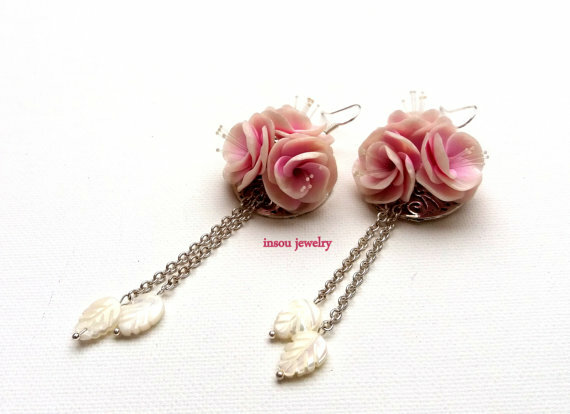 These earrings feature hand sculpted plum peonies painted with silver color. They are decorated with antique silver leaf charms and Czech glass beads. They hang on silver plated hooks. 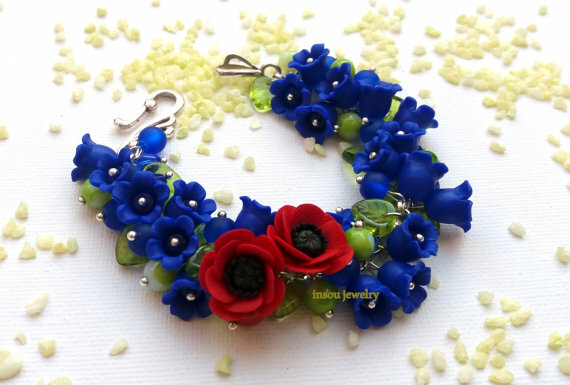 This bracelet features a beautiful bouquet of hand sculpted blue bell flowers and red poppies, decorated with Czech glass beads, mat glass beads, red coral beads and green leaves. Everything is attached on a silver plated chain. 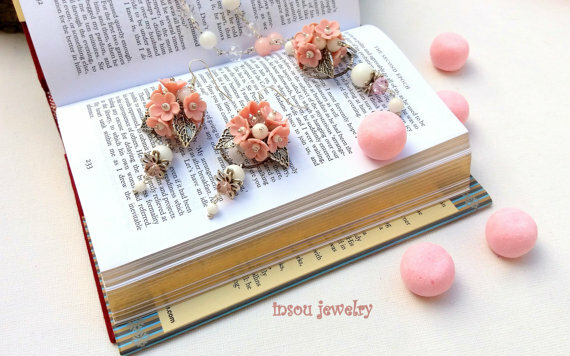 These earrings feature hand sculpted pearl with light pink sakura flowers. Each sakura bouquet is attached on an antique silver flower base, decorated with mother of pearl leaves beads. They hang on silver plated hooks. This romantic bracelet features an unusual flower bouquet in pastel colours; white lilacs, light pink sakura and lilac forget me nots, decorated with green leaves. 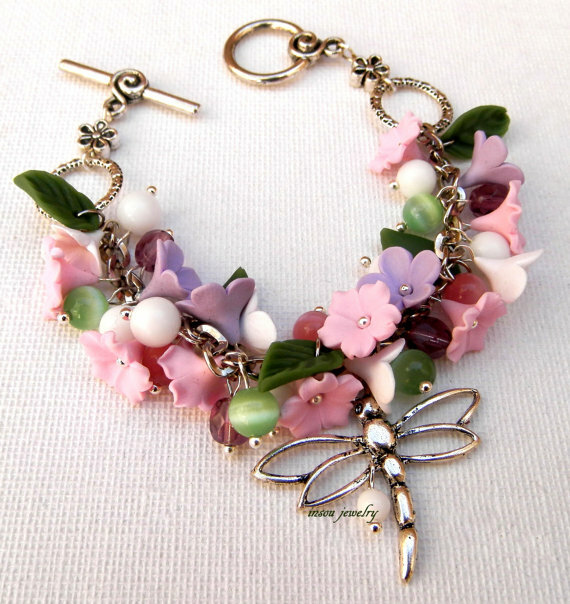 The flower bouquet is completed with Czech glass, cat’s eyes and alabaster beads, as well as a dragonfly charm. Everything is attached on a silver grey chain. 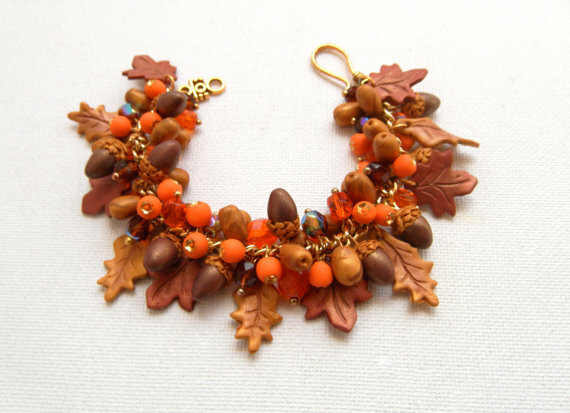 A handmade bracelet that features hand sculpted acorns, yellow gold- bronze fall leaves in combination with Czech glass beads. The bracelet is completed with orange rowan berries and metallic gold/ochre sea buckthorn fruits. Everything is attached on a gold plated chain. 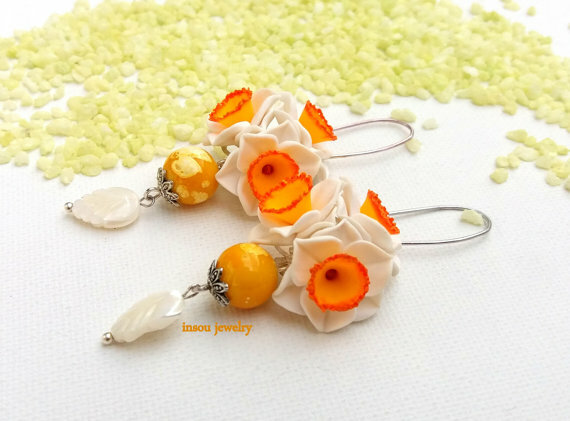 These earrings feature hand sculpted orange and vanilla buttercups, decorated with Czech glass and cat’s eyes beads and fall leaves. They hang on gold plated hooks. 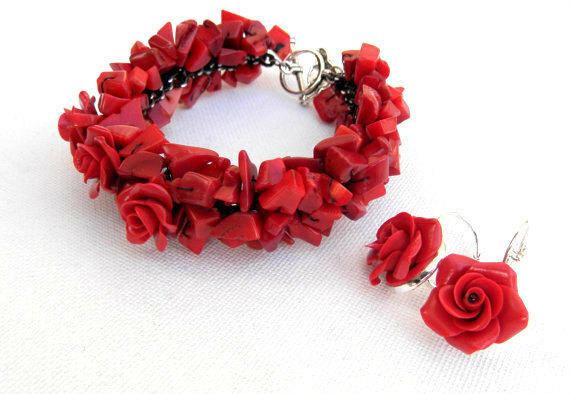 This bracelet features red corals in irregular pieces decorated with three hand sculpted red roses. The coral beads are attached with black wire and chain. It ends with a toggled clasp. The earrings feature delicate red roses attached on silver colored hooks. 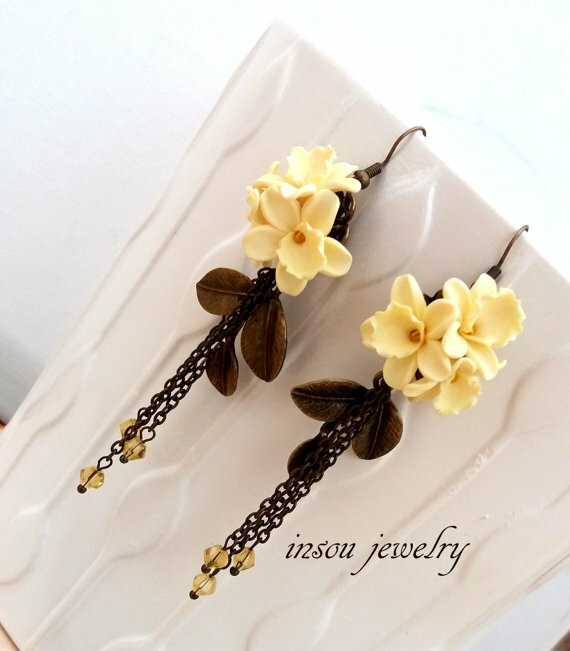 These earrings feature hand sculpted vanilla flowers. Each flower is made entirely by hand with polymer clay and petals are separated with a gold metallic outline. They are decorated in the center with transparent vanilla Czech glass beads. 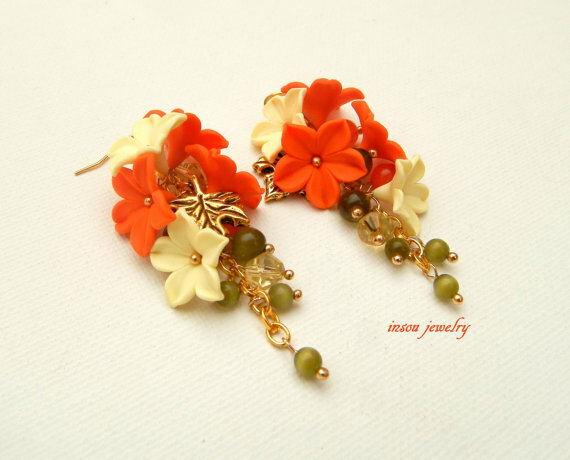 Earrings are completed with peach flowers and Czech beads attached on gold plated chains. They hang on gold plated hooks. These earrings feature hand sculpted blue drops with crackles of silver grey, resembling Lapis Lazuli. 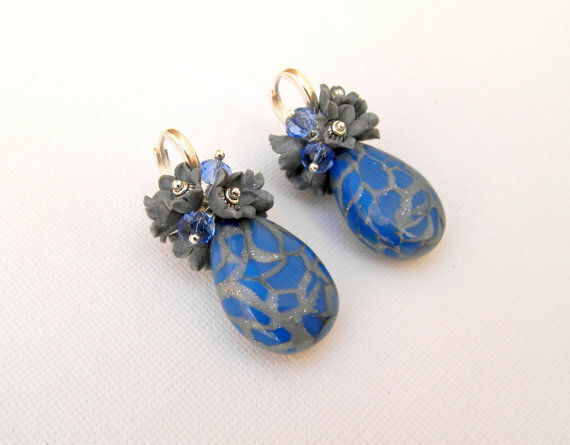 They are decorated with a bouquet of silver grey lilies of the valley and transparent blue Czech glass beads. They hang on silver plated hooks. 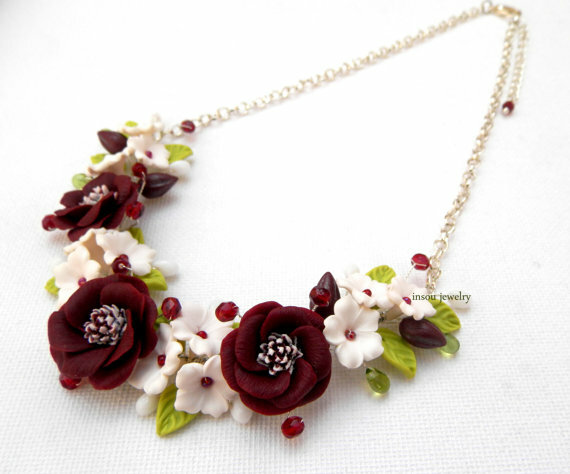 This necklace features unique dark red Cosmos flowers and white sakuras . The flower bouquet is decorated with light green leaves and Czech glass beads. everything is attached on a silver plated wire, covered with a silver ribbon. the necklace is completed with a silver plated chain and a lobster clasp. 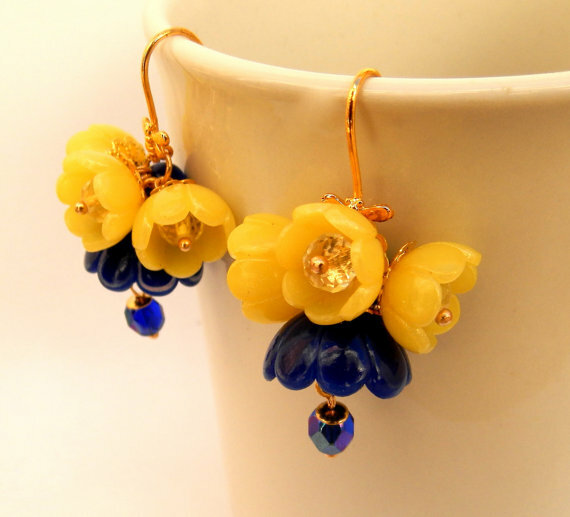 These earrings feature a bouquet of blue and citrine flowers. 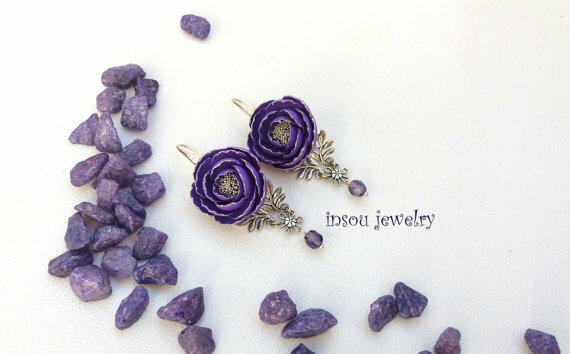 Each flower is made entirely by hand with polymer clay. They are decorated with transparent and blue Czech glass beads and a blue cat’s eyes bead. They are attached on gold plated hooks. 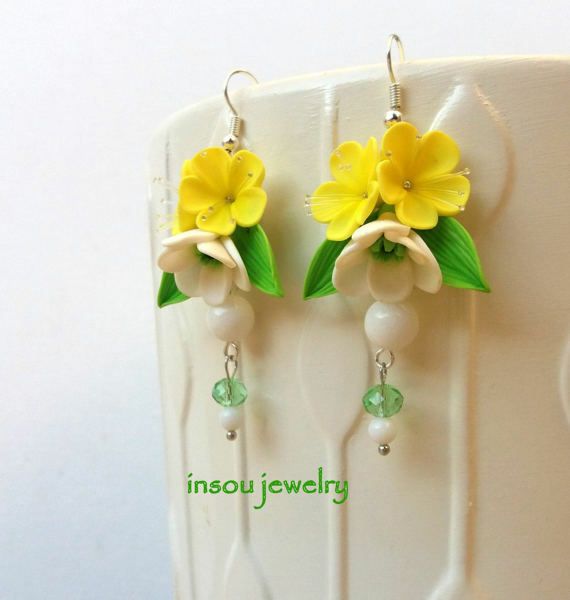 These earrings feature mini bouquets of yellow (sunflower color) buttercups and snowdrop flowers, which are painted with green dry pastel. They are attached on a gold color bead cup. The bouquets are decorated with green leaves, green agate, white jade and painted emerald glass beads. 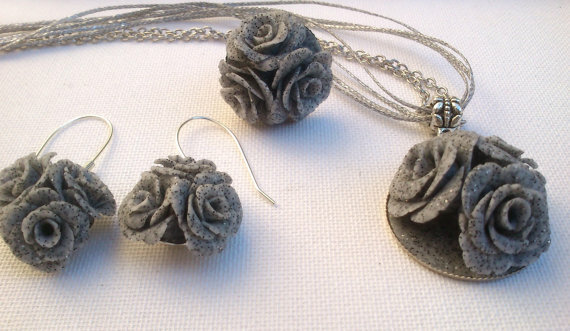 A grey roses jewelry set of necklace, earrings and ring. The necklace features a hand sculpted bouquet of roses of granite colour attached on a base. The pendant hangs on a silver plated chain and multiple silver wax strings. 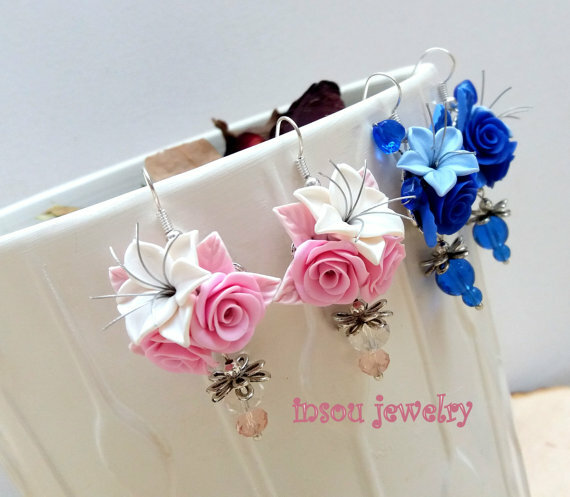 Flowers from earrings hang on silver hooks and the flower bouquet ring is adjustable. This floral set consists of a pendant, earrings, ring. This flower bouquet set consists of lilac flowers in violet and pearl tones. Each flower is hand sculpted and made from polymer clay. This set is very light! It will give the finishing touch on your outfit! Handmade Autumn set of necklace and earrings, made with beads and polymer clay. 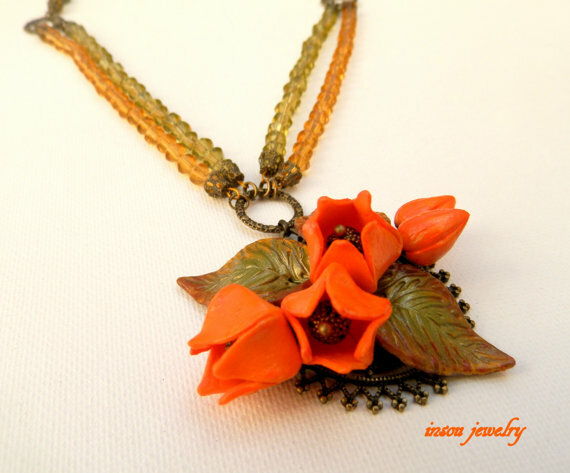 The necklace is made from a bouquet of handmade polymer clay flowers: ochre lilies, vanilla and tangerine buttercups. The flowers are painted with dry pastel ( lilies with gold, buttercups with brown and orange), and decorated with brown glass seed beads. The bouquet is attached on a wire, which is decorated with brown and orange satin ribbon. The necklace is completed with acrylic orange/ochre beads and a gold plated clasp. 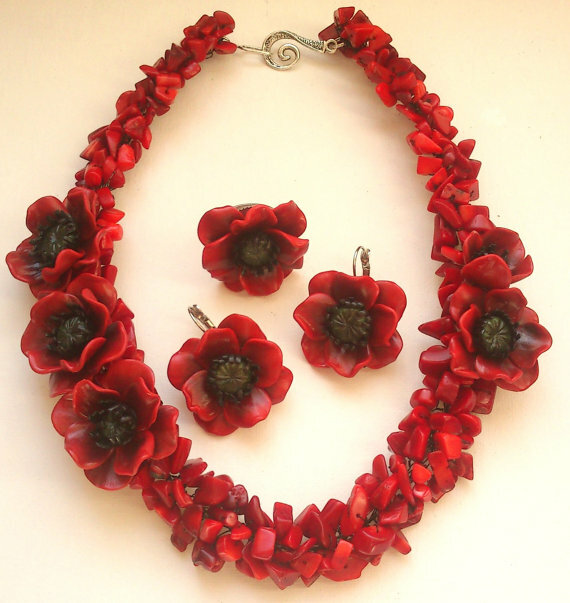 A poppy jewellery set of necklace,earrings and ring. A total summer must-have jewellery set. The necklace is made of red coral in irregular pieces and black wire. It is decorated with hand sculpted red poppies. The flowers are made with polymer clay (fimo). They are painted with black dry pastel and varnished in semi gloss, for a mat look and protection. 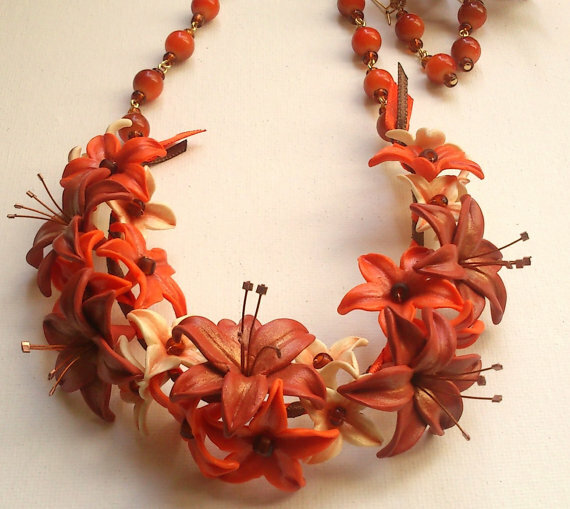 This necklace features a bouquet of dark orange lilies, yellow – brown sunflowers and ombre lemon colour roses. Each flower is totally hand sculpted by hand. 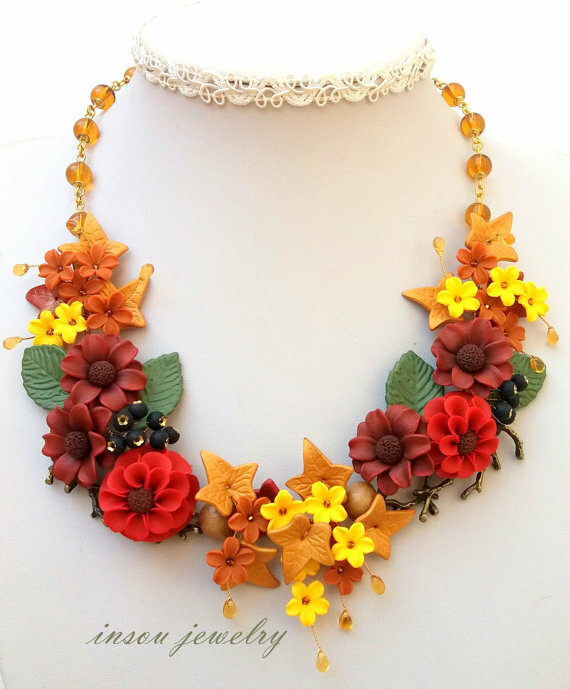 Flowers are decorated with gold coloured fall leaves and Czech glass beads. It ends with a gold coloured lobster clasp. This romantic bracelet features a beautiful bouquet of hand sculpted lilac tulips, decorated with Czech glass and cat’s eyes glass beads in lilac and yellow tones. The bouquet is completed with gold coloured leaves. Everything is attached on a gold plated chain. 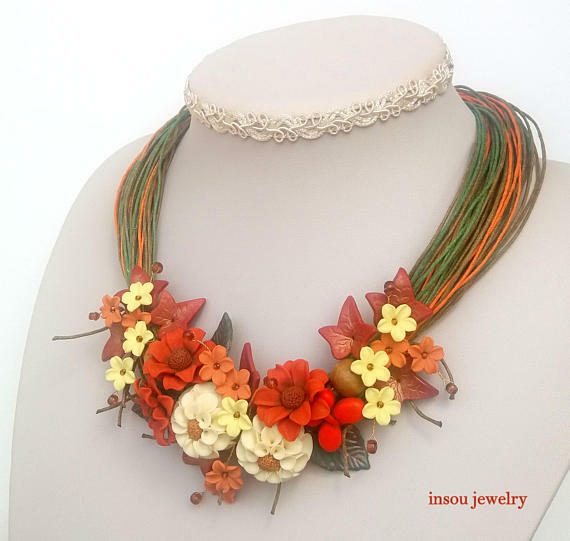 This necklace features beautiful orange physalis and fall leaves. Each flower and leaf is hand sculpted with polymer clay. Olive leaves are painted with gold and brown dry pastel and acrylics and varnished in gloss for protection. They are attached on a bronze base. The necklace is completed with brown and olive Czech glass beads and bronze charms. It ends with a heart clasp. 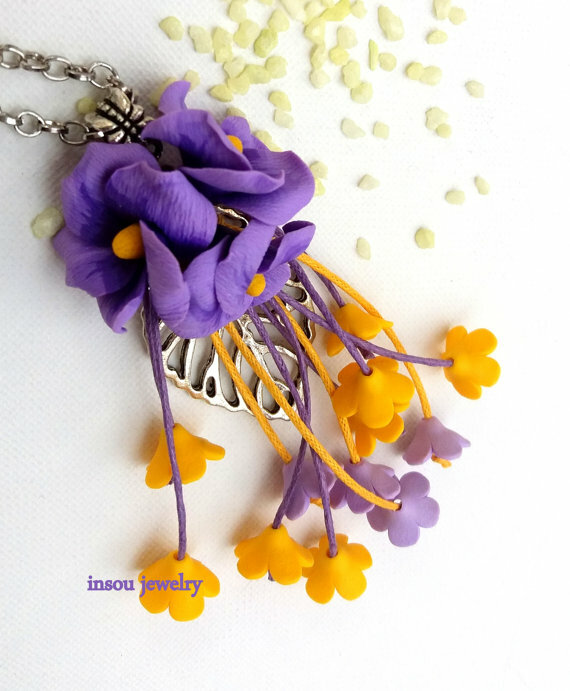 This necklace features a romantic flower bouquet of lilac malva,yellow and lilac forget me nots. The necklace is completed with antique silver leaf,yellow and lilac waxed cotton cords. It ends with a silver grey chain and a lobster clasp. These earrings feature hand sculpted anemones decorated with Czech glass coated beads,yellow marble beads and silver color heart charm. The flowers are attached on silver colored bead cups. They hang on silver plated hooks. 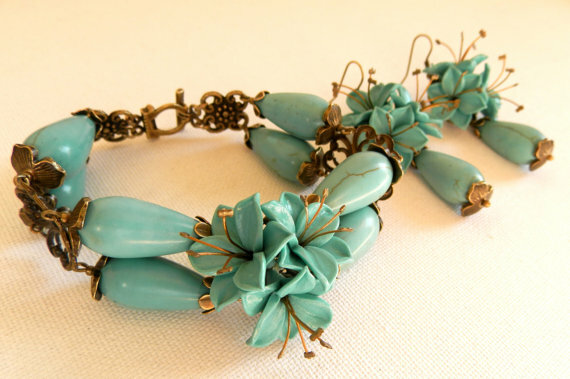 This bracelet features a lily flower bouquet decorated with synthetic turquoise drops (20×26 mm). It is completed with bronze flower charms and ends with a bronze clasp. 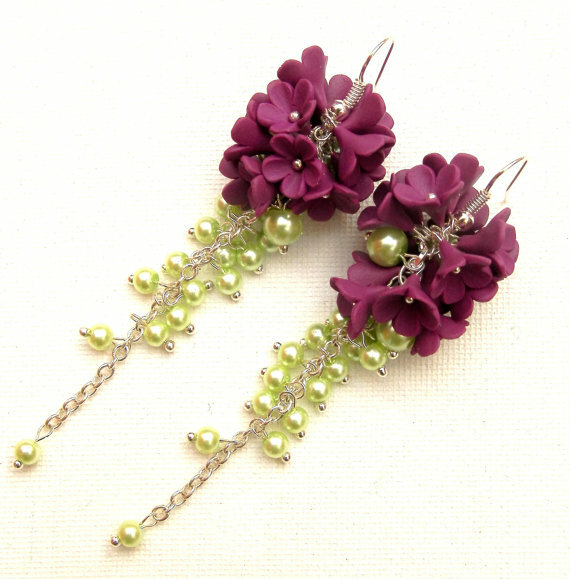 These earrings feature handmade violet lilacs, decorated with light green glass pearls. They hang on silver plated hooks. 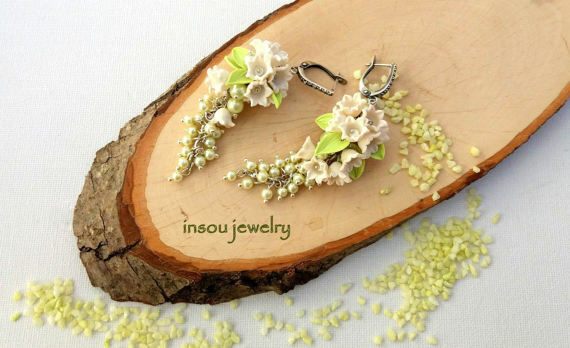 These earrings feature mini bouquets of hand sculpted narcissus flowers, decorated with yellow galactic glass beads and mother of pearl leaves. Each bouquet is attached on a silver coloured bead cup. They hang on silver plated hooks. 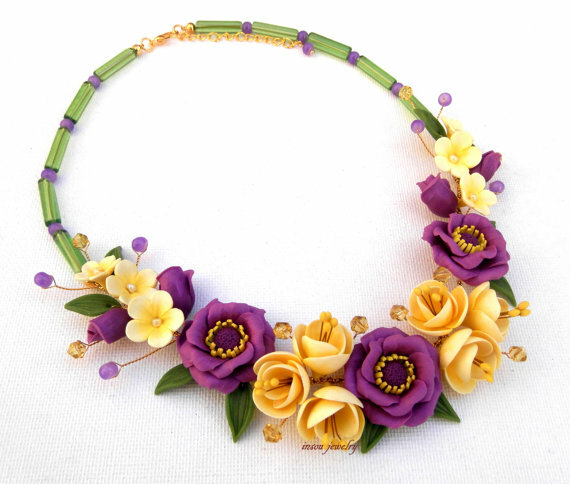 This beautiful necklace features a bouquet of hand sculpted vanilla flowers, lavender lilacs and violet buttercups. Flowers are decorated with polygonal Czech glass beads. The necklace is completed with a silver plated chain and a lobster clasp. 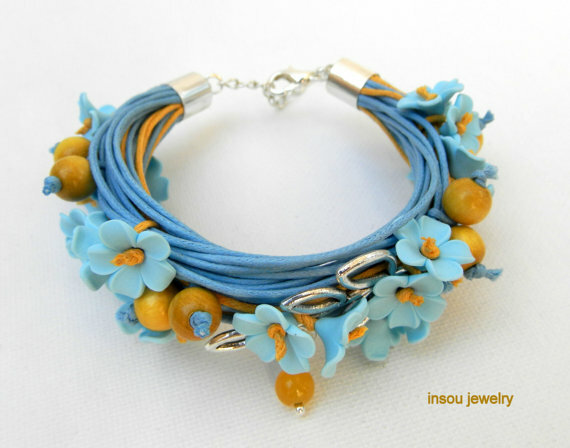 This delicate bracelet features a bouquet of hand sculpted flowers “Forget-me-nots”, yellow jade beads and light blue Czech glass beads.The final touch is an antique silver leaf! Everything is attached on a silver plated chain and it ends with a lobster clasp. The earrings are very light! These unique earrings feature a bouquet of white and gold flowers. Each flower is made entirely by hand with polymer clay and petals are separated with gold glitter outline. They are decorated with transparent Czech glass beads and attached on gold plated hooks. 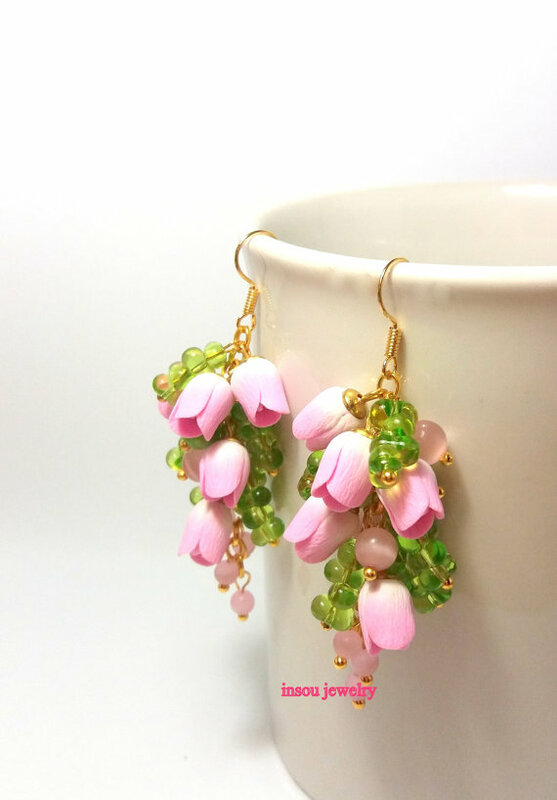 These romantic earrings feature a beautiful bouquet of hand sculpted pink tulips, decorated with Czech glass and cat’s eyes glass beads in pink and light green tones. They are attached on gold plated hooks. 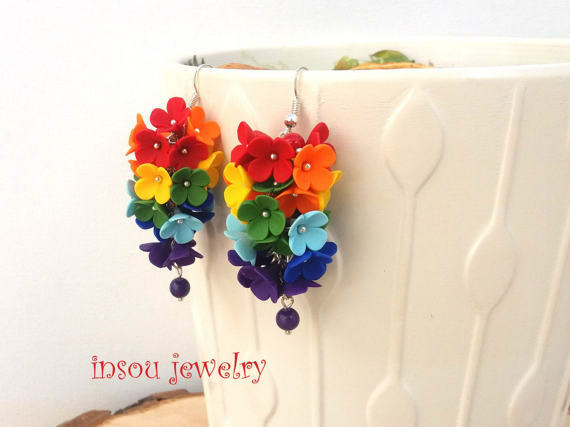 These earrings feature hand sculpted lilacs in every colour of the rainbow: red, orange, yellow, green, light blue, blue, violet. The flowers are decorated with jade and coral beads. This bracelet features violet lilacs with an Ombré effect. Each flower was made completely by hand – in a gradated range of shades of violet/ light pink. The bracelet is completed with Czech glass beads in violet tones, antique silver flower beads and bead cups. Everything is attached on a silver color chain. It ends with a toggled clasp. The earrings feature delicate bouquets of lilacs and beads, hanging on silver grey hooks. 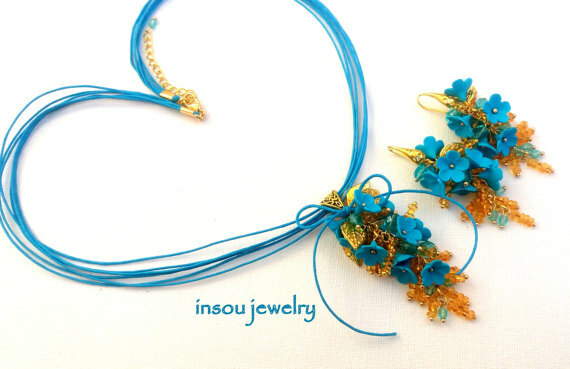 This necklace features a bouquet of delicate blue anemones, light blue rhododendron flowers, buttercups and bell flowers. The bouquet is decorated with white alabaster and blue Czech glass beads. Everything is attached on a silver plated wire, decorated with a silver ribbon. It is completed with a blue lamp work bead (with silver inside). It ends with a lobster clasp. Each flower is hand sculpted with patience and love with polymer clay. 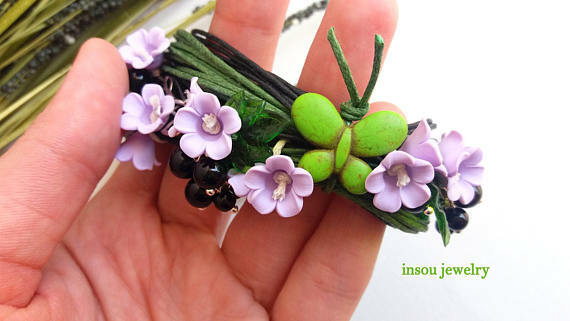 This bracelet features hand sculpted lavender – white berries, decorated with delicate lilies of the valley and lava imitation beads. The bracelet is completed with white alabaster beads. Everything is attached on a bronze chain. It ends with a toggled clasp. 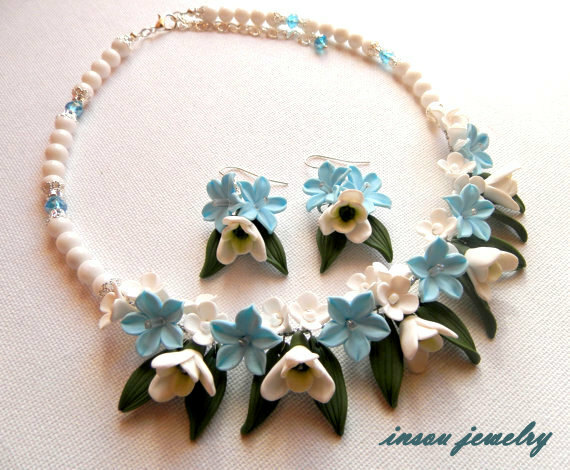 This necklace features a bouquet of light blue buttercups, white lilacs and snowdrop flowers decorated with leaves. They are attached on a silver color wire, decorated with silver ribbon. The necklace is completed with light blue Czech glass beads and white jade beads and ends with a lobster clasp. The earrings feature mini bouquets of buttercups and snowdrop flowers. These earrings feature hand sculpted light blue anemones, decorated with frosted and clear Czech glass beads. They are completed with leaf charms. They hang on silver plated hooks. 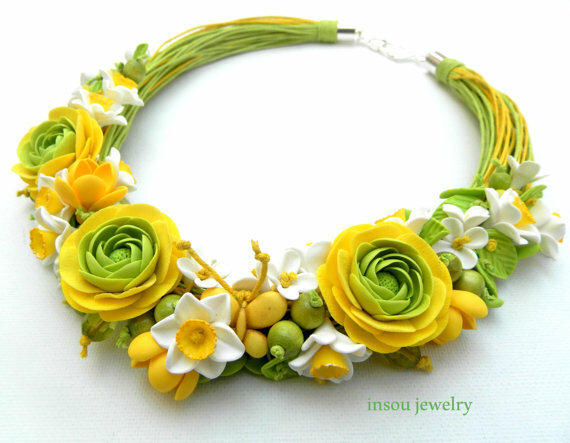 This spring necklace features a unique bouquet of delicate yellow green roses, lilacs, narcissus and saffron decorated with glass and wooden beads. Flowers and leaves are attached on waxed cotton cords. It is completed with a howlite butterfly charm. 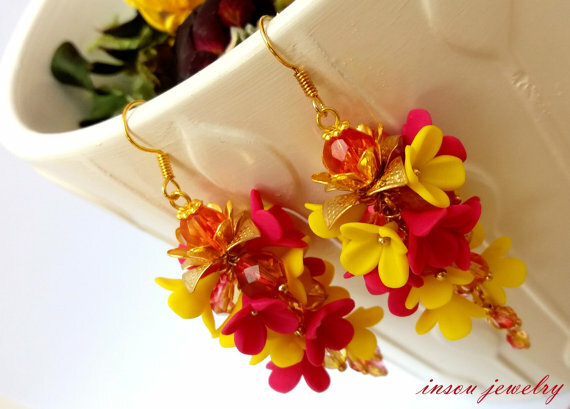 These earrings feature hand sculpted hot pink and lemon yellow lilacs decorated with Czech glass beads. They hang on gold plated hooks. This colourful necklace features hand sculpted sakura flowers in every colour of the rainbow: red, orange, yellow, green, light blue, blue, violet. The bouquet is decorated with transparent Czech glass beads, red coral and violet jade beads. It is completed with a silver plated chain and a lobster clasp. This statement necklace features a bouquet of hand sculpted vanilla flowers, decorated with antique bronze leaves, howlite butterfly charms, blue lapis lazuli, purple marble and wooden beads. It is completed with hand sculpted raspberries and blueberries. Everything is attached on waxed cotton cords. It ends with a bronze clasp. 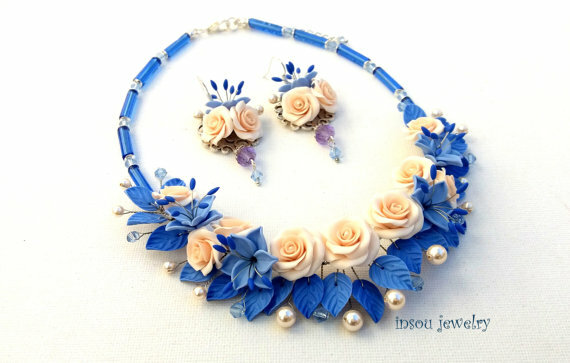 This is an amazing polymer clay flower jewelry set. The necklace features a unique bouquet of hand sculpted lilies, yellow and vanilla buttercups. The bouquet is decorated with Czech glass beads and yellow – turquoise marble and jade beads. Everything is attached on a gold plated wire, decorated by a gold coloured ribbon. The necklace ends with a lobster clasp. 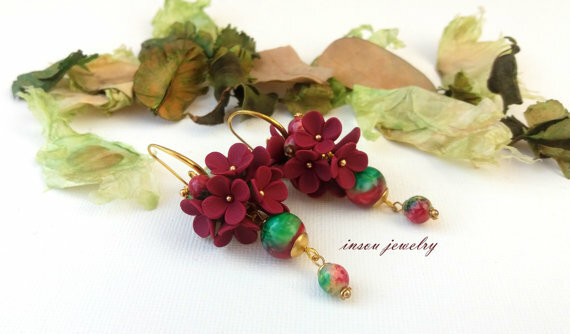 This set features captivating anemone flowers, hand sculpted with vanilla polymer clay. 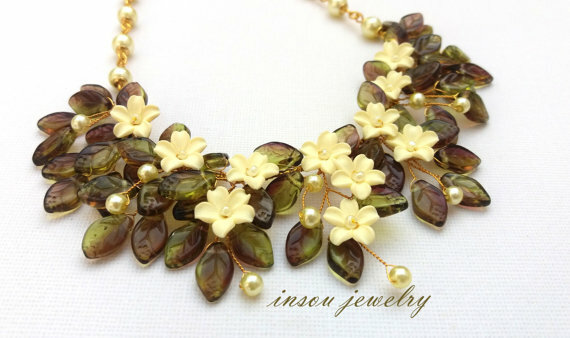 Flowers are decorated with yellow jade and light green Czech glass beads. Each flower is attached on antique gold base. They hang on gold plated hooks. This pendant features an anemone,decorated with light green Czech glass beads,yellow jade and gold leaf. It is completed with a gold plated chain and a lobster clasp. 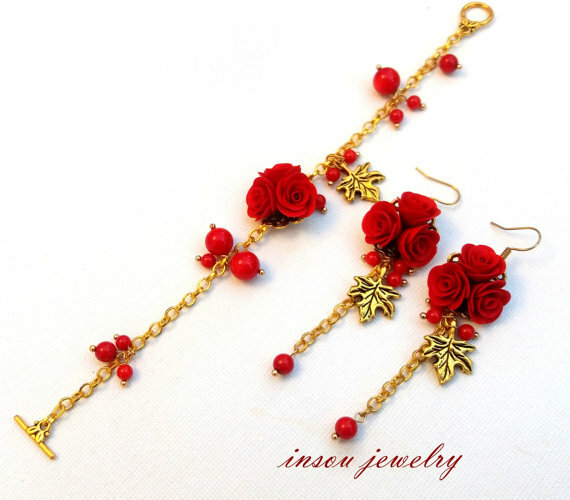 This delicate bracelet features a bouquet of hand sculpted roses and red coral beads. The final touch is a gold coloured leaf! Everything is attached on a gold plated chain and it ends with a toggle clasp. 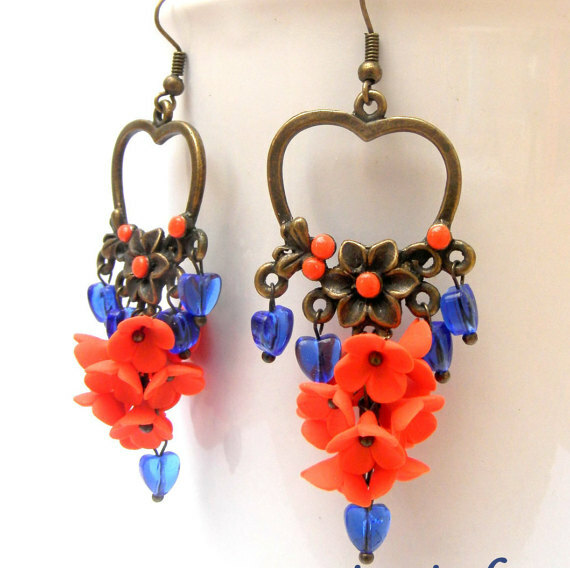 The earrings feature delicate bouquets of roses and coral beads. They measure 7.5 cm (2.9 in) with the gold plated hook, and 6 cm (2.4 in) without it. This romantic necklace features hand sculpted light pink flowers decorated with light pink swarovski glass pearls and glass leaves. It is completed with a silver plated chain and a lobster clasp. This bib necklace is made of strands of light blue, lilac and ivory waxed cotton cords. It is decorated with hand sculpted blueberries and lilacs flowers. It is completed with Czech glass beads, howlite butterfly, howlite beads, wooden beads, acrylic leaves and antique bronze charm(branch). It ends with a bronze clasp. This bracelet features hand sculpted light champagne lilacs decorated with coffee nuts and natural quartz beads in brown – beige tones. Everything is attached on a bronze chain. The earrings measure approximately 6 cm (2.4 in) with the bronze hooks. This green statement necklace features hand sculpted vanilla flowers decorated with vanilla Czech glass pearls and glass leaves. It is completed with a gold plated chain and a lobster clasp. 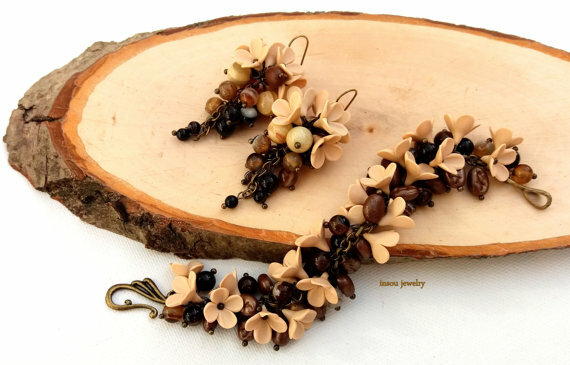 These romantic earrings feature hand sculpted vanilla flowers, decorated with bronze leaves and Czech glass beads. They hang on bronze hooks. 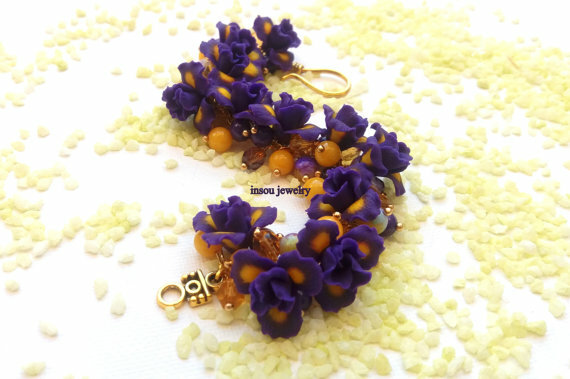 This romantic bracelet features a beautiful bouquet of hand sculpted purple/yellow irises, decorated with Czech glass and jade beads in yellow and purple tones. Everything is attached on a gold plated chain. 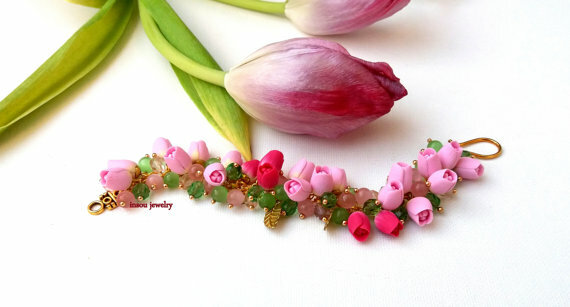 This romantic bracelet features a beautiful bouquet of hand sculpted light and hot pink tulips, decorated with Czech glass and cat’s eyes glass beads in green and pink tones. Everything is attached on a gold plated chain. 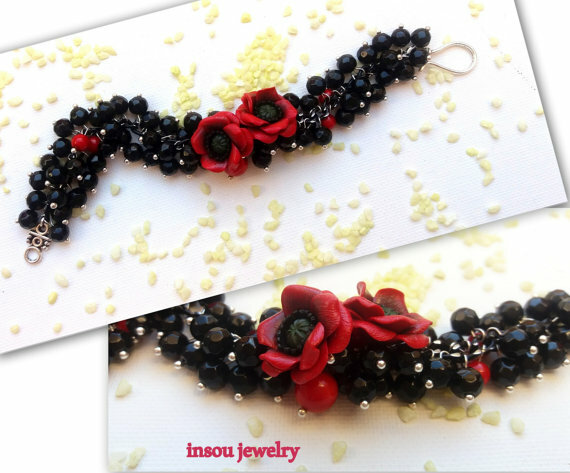 This unique bracelet features a beautiful bouquet of hand sculpted red poppies, decorated with black polygonal Czech glass beads and red coral beads. Everything is attached on a black chain. Pink Earrings: These romantic earrings feature delicate light pink roses and white lilies, decorated with Czech glass beads. The flower bouquet is attached on a bead cup. 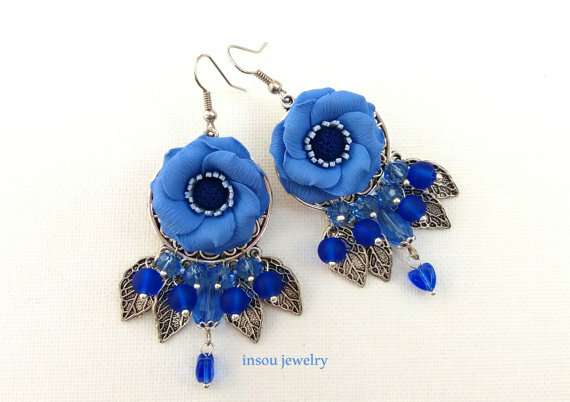 They hang on silver plated hooks.Blue Earrings: These romantic earrings feature delicate blue roses and light blue lilies, decorated with Czech glass beads. The flower bouquet is attached on a bead cup. They hang on silver plated hooks. 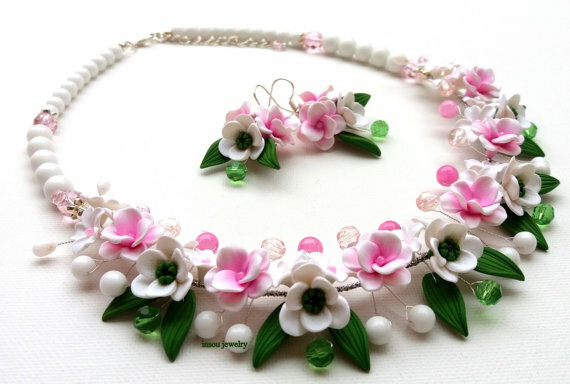 A romantic necklace featuring a beautiful bouquet of hand sculpted light pink flowers, decorated with jade, alabaster and Czech glass beads. It is completed with antique silver leaf charms. It ends with a silver plated lobster clasp. 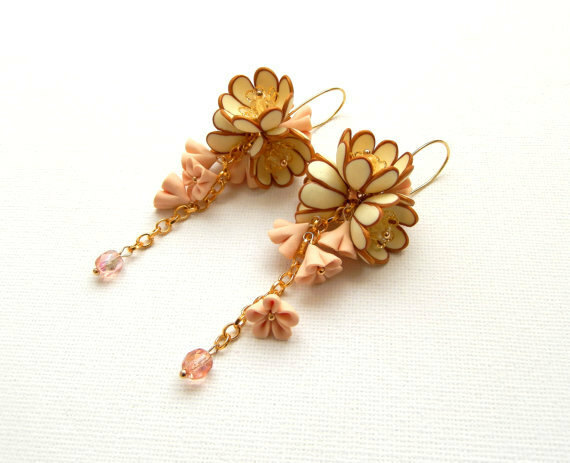 The earrings feature delicate bouquets of light pink flowers, decorated with a mix of beads and leaf charms. They are completed with silver coloured hoops and hang on silver plated hooks. This statement necklace features a bouquet of light peach roses, light blue lilies and leaves in shades of blue. Flowers are decorated with glass pearls and Czech glass beads. It is completed with a silver plated lobster clasp. 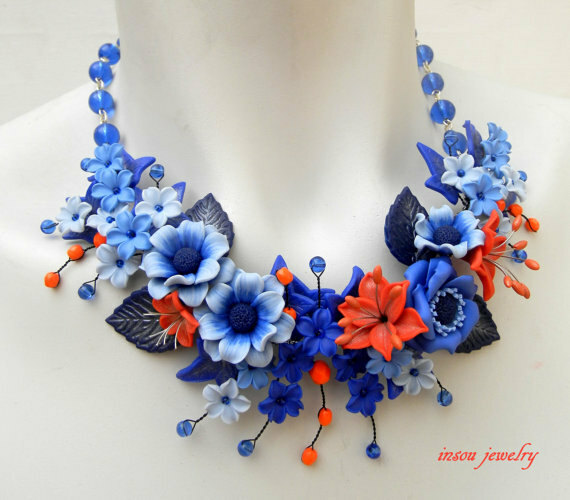 This is an amazing polymer clay flower jewelry set! 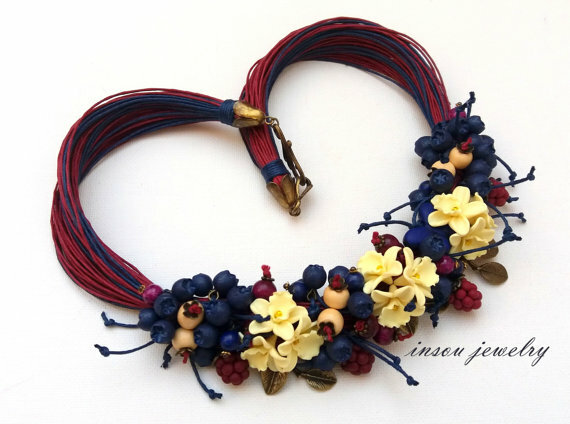 It contains a classy necklace features an eye-catching bouquet of hand sculpted plum lilacs, decorated with jade and golden beads and a plum turquoise coin bead. The elegant bouquet is attached on waxed cotton cords and ends with a gold plated lobster clasp. Earrings feature a mix of plum lilacs and beads. 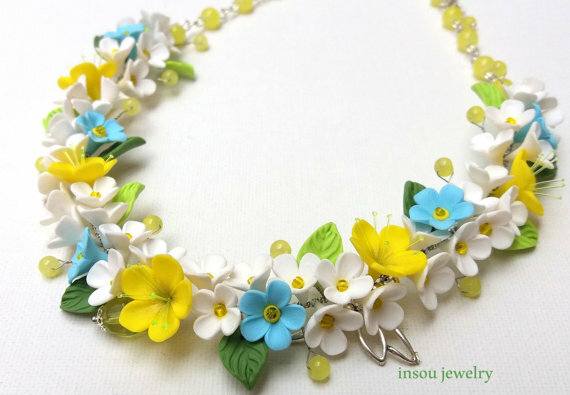 This necklace features a delightful mix of hand sculpted turquoise forget me not flowers, decorated with yellow farfalle glass and turquoise Czech beads. The flower bouquet is completed with gold coloured leaves and attached on waxed cotton cords. It ends with a gold plated lobster clasp. 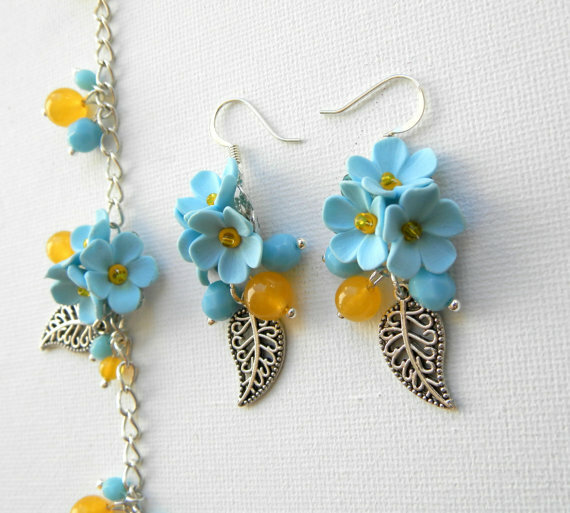 Earrings feature turquoise forget me nots, decorated with beads and leaves. They hang on gold plated hooks. 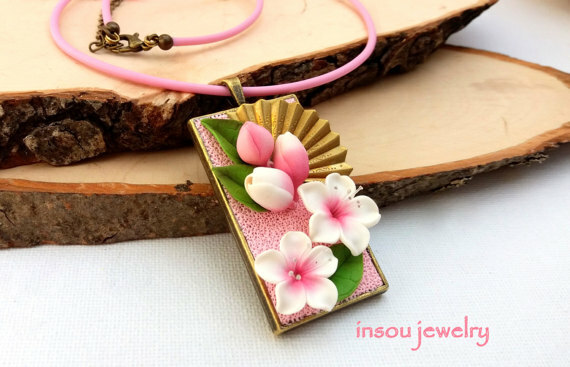 This unique pendant features hand sculpted sakura flowers and buds, decorated with green leaves and an antique gold fan. The pendant is attached on a light pink rubber cord, which ends with a bronze lobster clasp. These romantic earrings feature delicate hand sculpted lilies of the valley, decorated with glass pearls and light green leaves. 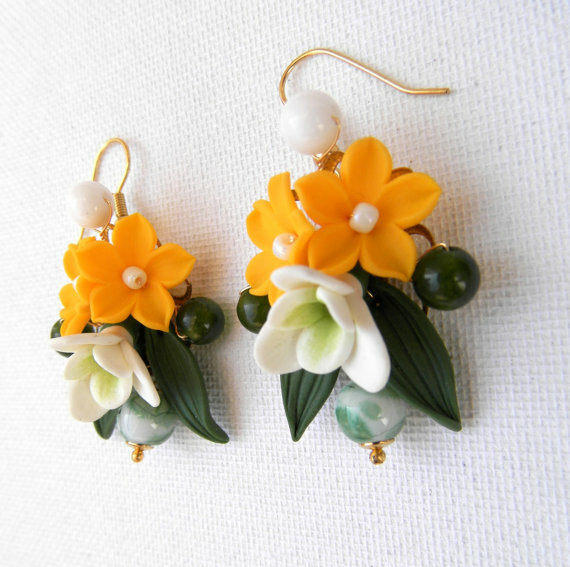 These earrings feature mini bouquets of yelow flowers and snowdrop flowers. The bouquet is decorated with light green leaves, Czech glass and alabaster beads. They hang on silver plated hooks. 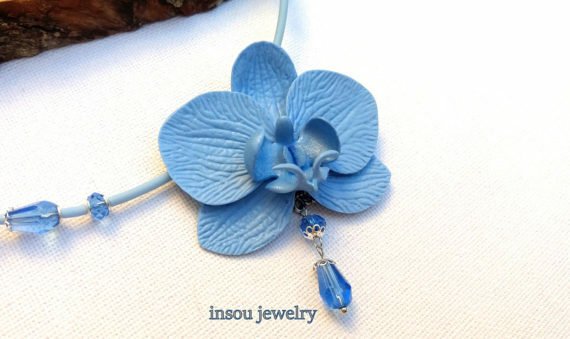 This necklace features a hand sculpted light blue orchid flower, decorated with elegant Czech glass beads. Everything is attached on a light blue rubber cord. It ends with a lobster clasp. 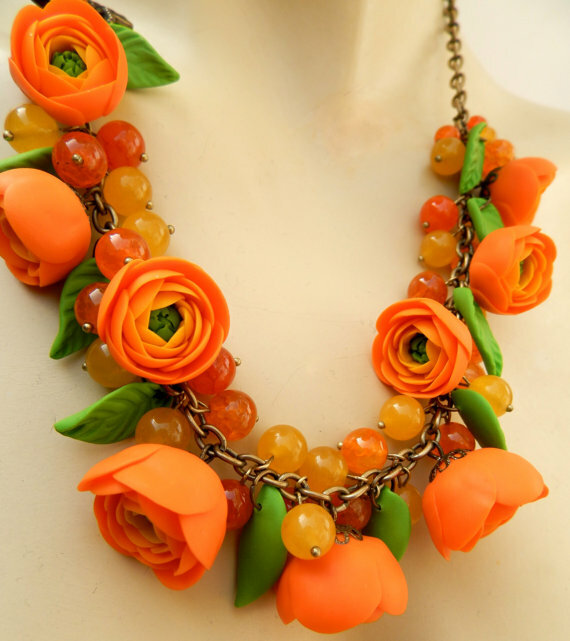 This spring necklace features a unique flower bouquet of blooming peach roses, decorated with white and light lemon flowers , all made with polymer clay by hand and Czech glass beads. It is completed with a dagongly charm. 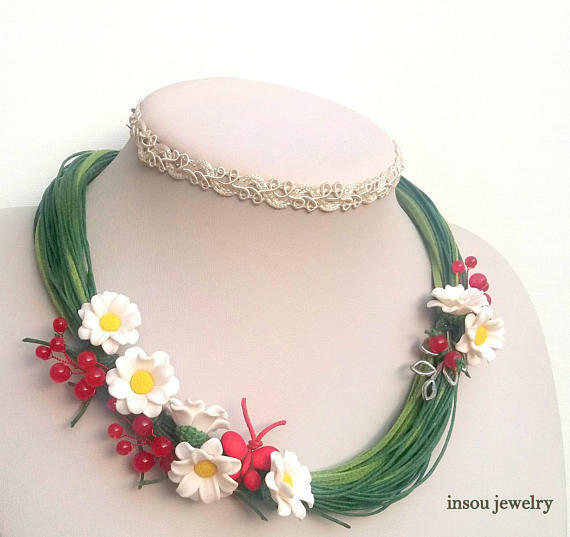 The necklace ends with a green rubber cord and a gold plated lobster clasp.All flowers and leaves are hand sculpted with patience and love with polymer clay. 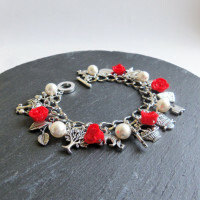 This charm bracelet features pretty hand sculpted redcurrant flowers, decorated with red and white beads, green leaves and a red howlite butterfly. Everything is attached on green and red waxed cotton cords. It ends with a silver coloured clasp. This charm bracelet features a bouquet of light blue flowers, decorated with wooden beads and an antique silver leaf charm. It is completed with a yellow howlite butterfly charm. Everything is attached on yellow and light blue waxed cotton cords. It ends with a flower clasp. Every flower is made by hand with polymer clay. 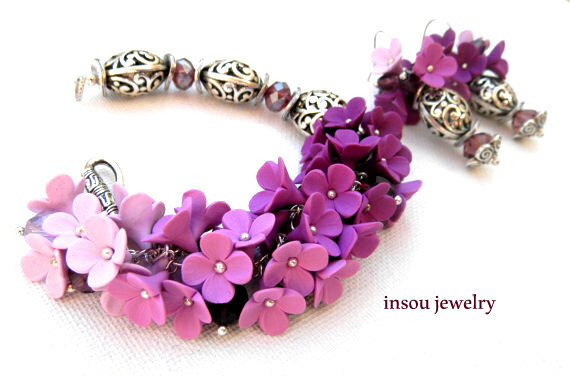 This charm bracelet features pretty hand sculpted blackcurrant flowers in lilac tones, decorated with glass leaves and beads. It is completed with a green howlite butterfly. Everything is attached on green and black waxed cotton cords. It ends with a silver coloured clasp. 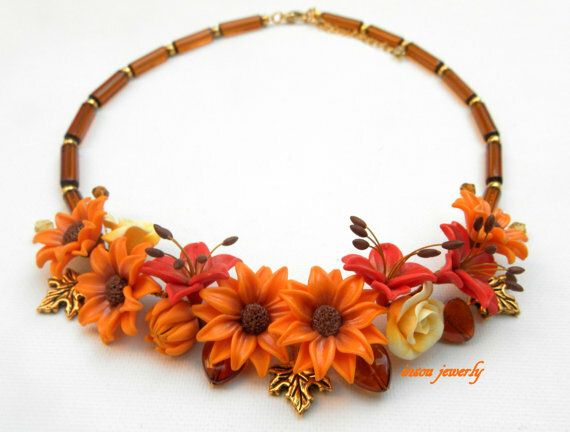 This statement necklace features a unique bouquet of delicate autumn flowers decorated with Czech glass and wood beads. Flowers and leaves are attached on waxed cotton cords. It is completed with a howlite butterfly charm. This necklace features a unique bouquet of delicate daisy and redcurrants(Czech glass beads), decorated with antique silver leaves(charm).Daisy and redcurrants are attached on waxed cotton and suede cords. It is completed with a howlite butterfly charm. This fall necklace features a delicate peach anemone flower, decorated with golden brown and peach lilies, buttercups and leaves. The necklace is completed with agate beads. Flowers are attached on a brnze chain, which ends with a lobster clasp. 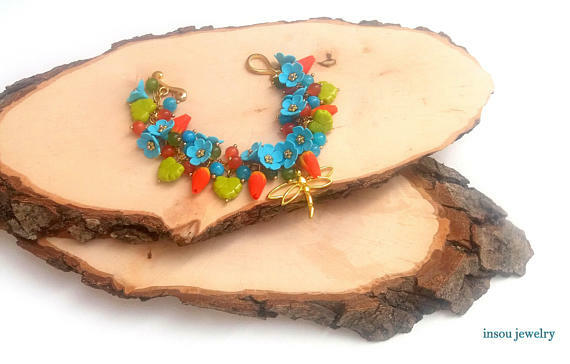 This bracelet features a beautiful bouquet of hand sculpted light blue forget me nots and orange tulips.It is decorated with Czech glass beads,Czech glass leaves,cat’s eye and marble. Everything is attached on a gold plated chain. It is completed with a dragonfly charm. All polymer clay flower jewelry I presented in this article are 100% handmade with dedication and love. 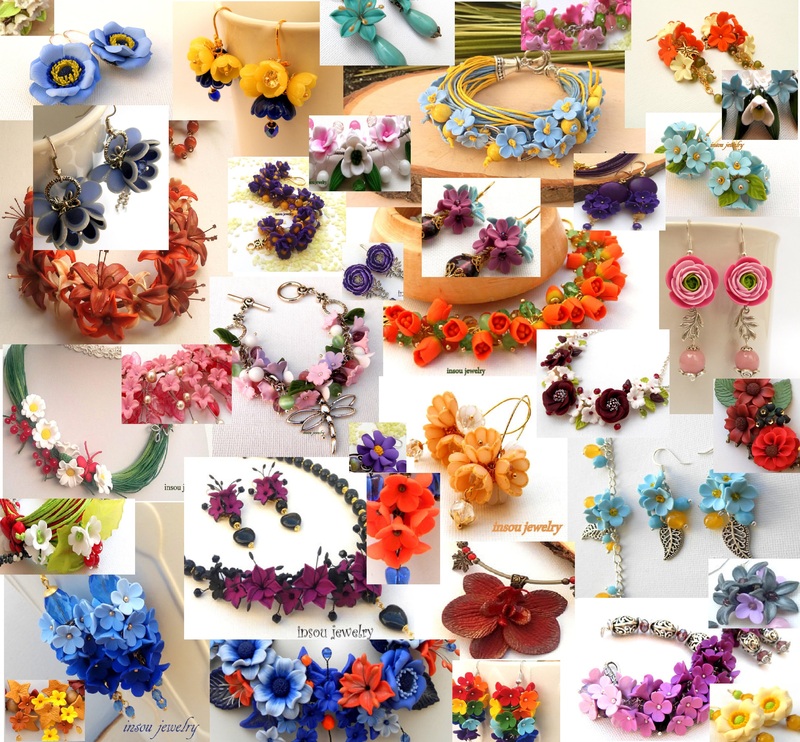 Did you enjoy this selection of polymer clay flower jewelry ? You want to see more? Go to this page to find more polymer jewelry creations for any occasion you have in mind.